Who were those famous men and women of science who gave us so much? What were they like? What motivated them and what led them to their amazing discoveries? This book takes us on an amazing journey through the hearts, minds and souls of so many scientists, inventors and scholars who have given civilization so much over the centuries. Many of these scientists had an idea. They had some sort of insight or inspiration when they observed the world about them and decided to make it better. They had humankind in mind, and they set about their work to improve the human condition. They decided to invent. They decided to explore. They decided to investigate and reveal some of nature’s deepest and darkest secrets to humankind. Some of these scientists had to overcome gargantuan obstacles to reach the pinnacle of their craft and success. Some had to work endlessly to develop their insights. Some worked with visible elements, while others delved into realms that cannot be seen by the naked eye. Many of these scientists were recognized by their peers and traveled to Gamla Stan in Stockholm, Sweden to receive the highest of honors, the Nobel Prize in their field. Some of these scientists’ names are forever etched in our memories; Gregor Mendel, Marie Curie, and others will always be noted and recognized for their foundational work, which has given humankind so much. Other scientists and their discoveries have laid the foundation for future work in the realms of medicine and other domains. 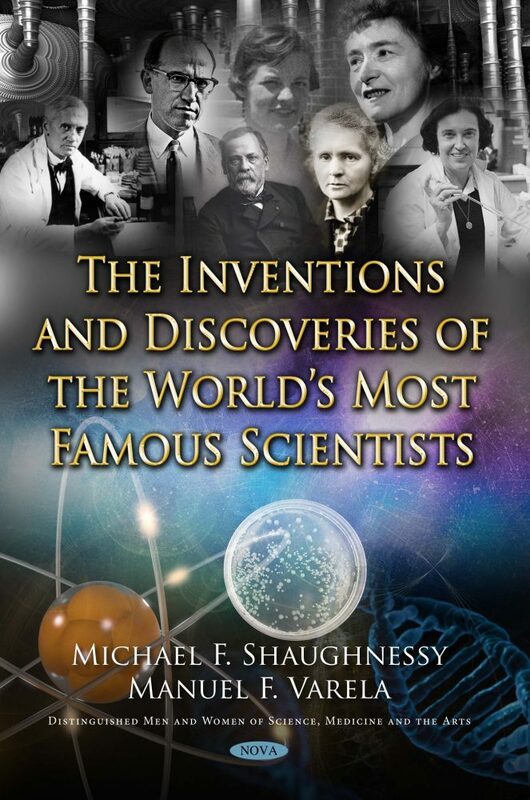 This book takes us on a journey so that we can learn more about the lives and passions of the most famous scientists from the past and present. Their foibles, their strengths and their passions will be revealed and discovered in this text, just as their discoveries have opened the doors for their followers and students that they have mentored over the years. We can learn much from the lives of these famous scientists; not just about their studies, but the way in which they conducted their lives and from the contributions that they gave to others, their countries and to society at large. We are about to undergo an adventure. An adventure into the minds of the world’s most famous scientists and inventors; we will be guided by Dr. Manuel Varela who will share his own knowledge and past encounters with some contemporary scientists, as well as some stories that make their famous people more human and caring, and more than just a formula. We must acknowledge several people in this endeavor, including Ann Varela, Dr. Ken Craddock and other anonymous reviewers. Furthermore, we have to thank Jimmy Kilpatrick of EducationViews as many of these interviews appeared first in that online journal. And now, the journey begins: A journey not just of interest, but of hope. Hope for a better future for all humankind via the discoveries and the inventions of the world’s greatest scientists. Andersen, J. L., G. X. He, P. Kakarla, C. R. K, S. Kumar, W. S. Lakra, M. M. Mukherjee, I. Ranaweera, U. Shrestha, T. Tran, and M. F. Varela. 2015. Multidrug efflux pumps from Enterobacteriaceae, Vibrio cholerae and Staphylococcus aureus bacterial food pathogens. International journal of environmental research and public health 12:1487-1547. Atlas, R. M. 2000. Many Faces, Many Microbes: Personal Reflections in Microbiology. ASM Press. Baron, J. 2014. The Life of Edward Jenner M. D. Cambridge University Press. Beck, R. W. 2000. A Chronology of Microbiology in Historical Context. ASM Press. Berg, J. M., L. Stryer, J. L. Tymoczko, and G. J. Gatto. 2015. Biochemistry. Macmillan Learning. Britton, D. R., M. Varela, A. Garcia, and M. Rosenthal. 1986. Dexamethasone suppresses pituitary-adrenal but not behavioral effects of centrally administered CRF. Life Sci. 38:211-6. Brock, T. D. 1975. Milestones in Microbiology. American Society for Microbiology. Brock, T. D. 1988. Robert Koch, a life in medicine and bacteriology. Science Tech Publishers. Brock, T. D., G. L. Geison, and R. J. Dubos. 2014. Pasteur and Modern Science. Springer Berlin Heidelberg. Brownlee, G. G., and E. Southern. 2014. Fred Sanger - Double Nobel Laureate: A Biography. Cambridge University Press. Bruns, M. M., P. Kakarla, J. T. Floyd, M. M. Mukherjee, R. C. Ponce, J. A. Garcia, I. Ranaweera, L. M. Sanford, A. J. Hernandez, T. M. Willmon, G. L. Tolson, and M. F. Varela. 2017. Modulation of the multidrug efflux pump EmrD-3 from Vibrio cholerae by Allium sativum extract and the bioactive agent allyl sulfide plus synergistic enhancement of antimicrobial susceptibility by A. sativum extract. Archives of microbiology 199:1103-1112. Burgos, J. M., B. A. Ellington, and M. F. Varela. 2005. Presence of multidrug-resistant enteric bacteria in dairy farm topsoil. J. Dairy Science, 88:1391-1398. Chernow, R. 2005. Alexander Hamilton. Penguin Press. Cook, G. C. 2007. Tropical Medicine: An Illustrated History of the Pioneers. Academic Press, Paris. Crichton, M. 2012. Jurassic Park: A Novel. Random House Publishing Group. Crick, F. 2008. What Mad Pursuit. Basic Books. Curie, E., and V. Sheean. 2007. Madame Curie - A Biography by Eve Curie. Read Books. Debra, P., and E. Forster. 2000. Louis Pasteur. Johns Hopkins University Press. De Kruif, P. 2002. Microbe Hunters. Harcourt Brace. Diamond, J. 2017. Guns, Germs, and Steel: The Fates of Human Societies. W. W. Norton. Exton, J. H. 2013. Crucible of Science: The Story of the Cori Laboratory. Oxford University Press. Floyd, J. L., Smith, K. P., Kumar, S. H., Floyd J. T., and M. F. Varela. 2010. LmrS is a Multidrug Efflux Pump of the Major Facilitator Superfamily from Staphylococcus aureus. Antimicrobial Agents and Chemotherapy, 54:5406-5412. Garrett, L. 1994. The Coming Plague: Newly Emerging Diseases in a World Out of Balance. Farrar, Straus and Giroux. Gaynes, R. P. 2011. Germ Theory: Medical Pioneers in Infectious Diseases. ASM Press. Geison, G. L. 2014. The Private Science of Louis Pasteur. Princeton University Press. Goldsmith, B. 2005. Obsessive Genius: The Inner World of Marie Curie. W. W. Norton. Hager, T. 1995. Force of Nature: The Life of Linus Pauling. Simon & Schuster. Hargittai, M. 2015. Women Scientists: Reflections, Challenges, and Breaking Boundaries. Oxford University Press. Harold, F. M. 1986. The Vital Force: A Study of Bioenergetics. W. H. Freeman. Henig, R. M. 2017. The Monk in the Garden: The Lost and Found Genius of Gregor Mendel, the Father of Genetics. Houghton Mifflin Harcourt. Holmes, F. L. 1991. Hans Krebs: Architect of intermediary metabolism, 1933-1937. Oxford University Press. Jacob, F. 1995. The Statue Within: An Autobiography. Cold Spring Harbor Laboratory Press. Jacobs, C. 2015. Jonas Salk: A Life. Oxford University Press. Jardine, L. 2000. Ingenious Pursuits: Building the Scientific Revolution. Anchor Books. Jardine, L. 2005. The Curious Life of Robert Hooke: The Man Who Measured London. Harper Collins. Johnson, S. 2006. The Ghost Map: The Story of London's Most Terrifying Epidemic - and How It Changed Science, Cities, and the Modern World. Penguin Publishing Group. Joklik, W. K. 1999. Microbiology: A Centenary Perspective. ASM Press. Judson, H. F. 2004. The Eighth Day of Creation: Makers of the Revolution in Biology. Cold Spring Harbor Laboratory Press. Kakarla, P., J. Floyd, M. Mukherjee, A. R. Devireddy, M. A. Inupakutika, I. Ranweera, R. Kc, U. Shrestha, U. R. Cheeti, T. M. Willmon, J. Adams, M. Bruns, S. K. Gunda, and M. F. Varela. 2017. Inhibition of the multidrug efflux pump LmrS from Staphylococcus aureus by cumin spice Cuminum cyminum. Archives of microbiology 199:465-474. Kakarla P., Ranjana K., Shrestha U., Ranaweera I., Mukherjee M. M., Willmon T. M., Hernandez A. J., Barr S. R., Varela M. F. 2017. Functional roles of highly conserved amino acid sequence motifs A and C in solute transporters of the major facilitator superfamily. In: Drug Resistance in Bacteria, Fungi, Malaria, and Cancer. Springer International Publishing. pp. 111-140. Krasner, R. I. 2008. 20th Century Microbe Hunters. Jones & Bartlett Learning. Kean, S. 2012. The Violinist's Thumb: And Other Lost Tales of Love, War, and Genius, as Written by Our Genetic Code. Little, Brown. Kelly, J. 2006. The Great Mortality: An Intimate History of the Black Death, the Most Devastating Plague of All Time. Harper Collins. Krebs, H., and A. Martin. 1981. Reminiscences and reflections. Clarendon Press. Krebs, H. A., and R. Schmid. 1981. Otto Warburg. Clarendon Press. Kumar, S., He, G., Kakarla, P., Shrestha, U., Ranjana, K. C., Ranaweera, I., Willmon, T. M., Barr, S. R., Hernandez, A. J., and M. F. Varela, 2016. Bacterial Multidrug Efflux Pumps of the Major Facilitator Superfamily as Targets for Modulation. Infectious disorders drug targets 16:28-43. Kumar, S., and M. F. Varela. 2012. Biochemistry of bacterial multidrug efflux pumps. International journal of molecular sciences 13:4484-4495. Kumar, S., M. M. Mukherjee, and M. F. Varela. 2013. Modulation of Bacterial Multidrug Resistance Efflux Pumps of the Major Facilitator Superfamily. International journal of bacteriology 2013:15. doi:10.1155/2013/204141. Kumar, S., K. C., R., Sanford, L. M., Hernandez, A. J., Kakarla, P., Varela, M. F. 2016. Structural and functional roles of two evolutionarily conserved amino acid sequence motifs within solute transporters of the major facilitator superfamily. Trends Cell Mol Biol 11, 41-53. Lax, E. 2015. The Mold in Dr. Florey's Coat: The Story of the Penicillin Miracle. Henry Holt and Company. Lekshmi M., Ammini P., Kumar S., Varela M. F. 2017. The Food Production Environment and the Development of Antimicrobial Resistance in Human Pathogens of Animal Origin. Microorganisms. 5(1):11. Levy, S. B. 2013. The Antibiotic Paradox: How Miracle Drugs Are Destroying the Miracle. Springer US. Lipmann, F. A. 1971. Wanderings of a biochemist. Wiley-Interscience. Lwoff, A. 2012. Origins of Molecular Biology: A Tribute to Jacques Monod. Elsevier Science. McCullough, D. 2008. John Adams. Simon & Schuster. Miesfeld, R. L., and M. M. McEvoy. 2017. Biochemistry. W. W. Norton. Monod, J., and A. Wainhouse. 1997. Chance and Necessity: An Essay on the Natural Philosophy of Modern Biology. Penguin. Mukherjee, M., P. Kakarla, S. Kumar, E. Gonzalez, J. T. Floyd, M. Inupakutika, A. R. Devireddy, S. R. Tirrell, M. Bruns, G. He, I. E. Lindquist, A. Sundararajan, F. D. Schilkey, J. Mudge, and M. F. Varela. 2014. Comparative genome analysis of non-toxigenic non-O1 versus toxigenic O1 Vibrio cholerae. Genomics discovery 2:1-15. Müller-Hill, B. 1996. The Lac Operon: A Short History of a Genetic Paradigm. Walter de Gruyter. Mullis, K. 2010. Dancing Naked in the Mind Field. Knopf Doubleday Publishing Group. Nelson, D. L., and M. M. Cox. 2012. Lehninger Principles of Biochemistry: 6th Edition. Macmillan Learning. Nicholls, D. G. 2013. Bioenergetics. Elsevier Science. Olby, R. 2013. The Path to the Double Helix: The Discovery of DNA. Dover Publications. Oshinsky, D. M. 2005. Polio: An American Story. Oxford University Press. Peng, Y., R. L. Hernandez, R. R. Crow, S. E. Jones, S. A. Mathews, A. M. Arnold, E. F. Castillo, J. M. Moseley, and M. F. Varela. 2008. Pasteurized whole milk confers reduced susceptibilities to the antimicrobial agents trimethoprim, gatifloxacin, cefotaxime and tetracycline via the marRAB locus in Escherichia coli. Journal of Dairy Research 75:491-496. Prebble, J., and B. Weber. 2003. Wandering in the Gardens of the Mind: Peter Mitchell and the Making of Glynn. Oxford University Press. Ranaweera, I., U. Shrestha, K. C. Ranjana, P. Kakarla, T. M. Willmon, A. J. Hernandez, M. M. Mukherjee, S. R. Barr, and M. F. Varela. 2015. Structural comparison of bacterial multidrug efflux pumps of the major facilitator superfamily. Trends in cell & molecular biology 10:131-140. Ranjana, K. C., Shrestha, U., Kumar, S., Ranaweera, I., Kakarla, P., Mukherjee, M. M., Barr, S. A., Hernandez, A. J., Willmon, M. T., Benham, B. C., and M. F. Varela. 2017. Molecular biology of multidrug resistance efflux pumps of the major facilitator superfamily from bacterial pathogens. In: Foodborne Pathogens and Antibiotic Resistance. (O. Singh, ed. ), pp. 303-329. John Wiley & Sons. Ridley, M. 2013. Genome: The Autobiography of a Species in 23 Chapters. HarperCollins. Sayre, A. 2000. Rosalind Franklin and DNA. Norton. Shrestha, U., Ranaweera, I., Kumar, S., K. C., R., Kakarla, P., Lakra, W. S., He, G. X., Andersen, J. L., and Varela, M. F., 2015. Multidrug Resistance Efflux Pumps of Salmonella enterica. In: Salmonella: Prevalence, Risk Factors and Treatment Options (C.B. Hackett, ed.) pp. 1-30, Nova Science Publishers. Skloot, R. 2011. The Immortal Life of Henrietta Lacks. Broadway Paperbacks. Smith, K. P., Kumar, S. and M. F. Varela. 2009. Identification, cloning, and functional characterization of EmrD-3, a putative multidrug efflux pump of the major facilitator superfamily from Vibrio cholerae O395. Archives of Microbiology 191:903-911. Varela M. F., Andersen J. L., K. C. R., Kumar S., Sanford L. M., Hernandez A. J. 2017. Bacterial resistance mechanisms and inhibitors of multidrug efflux pumps belonging to the major facilitator superfamily of solute transport systems. In: Frontiers in Anti-Infective Drug Discovery, pp. 109-131. Bentham Science Publishers. Varela, M. F.; Wilson, T. H. 1996. Molecular biology of the lactose carrier of Escherichia coli. Biochimica et Biophysica Acta. 1276, 21–34. Watson, J. D. 2011. The Double Helix: A Personal Account of the Discovery of the Structure of DNA. Scribner. Zimmer, C. 2008. Microcosm: E. coli and the New Science of Life. Knopf Doubleday Publishing Group.